North Arm Cove is a quiet little coastal village now but had some dreams been realised it could well have turned into a bustling port city. " The most central spot, where the new city is to be in the Great Port of the New Northern State. " North Arm Cove - 100th Birthday! 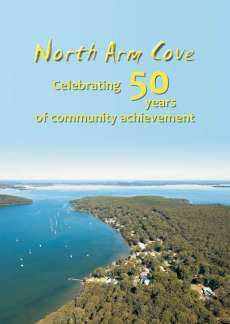 Read more about North Arm Cove - 100th Birthday! This is not a story about the army take-over of our peninsular. Those events are however mentioned in the book about our village – which is of course a great gift option for family and friends! Instead, this is a story about the past efforts of the local community to change the name of our village. The struggle for water access in North Arm Cove - including a community boat ramp and jetty - has been a long one which, until now, has always met with disappointment. For almost 50 years the Residents Association (which has over time also been known as the Progress Association and the Village Association) “water access” has been a recurring issue of concern. Names never count - said C.J. Dennis's Sentimental Bloke - But ar, I like "Doreen!" It is true that roses would still smell as sweet whatever you called them - yet knowing the correct name of a place or street when you are travelling can be quite handy.